This article is about the real-world major historical figure. For the comic book character, General Ross, see Thunderbolt Ross. For the art critic, see Robbie Ross. Major-General Robert Ross (1766 – 12 September 1814) was an officer in the British Army, born in Ireland, who served in the Napoleonic Wars and the War of 1812. Ross enlisted in the British Army in 1789. He served as an officer in several battles during the Napoleonic Wars. In 1809, he was sent to serve in the Peninsular War. He was wounded in the neck at the Battle of Orthez in France on February 27, 1814. Upon returning to duty later that year, Ross was made a major general and sent to North America, where he took command of a British force designated to attack the United States capital of Washington D.C. during the War of 1812. Ross's professional soldiers quickly defeated a poorly organized American militia at the Battle of Bladensburg on August 24, and that evening proceeded to enter Washington. The British Army burned many important U.S. Government buildings, including the White House and the Capitol, demoralizing and greatly damaging the American war effort. Ross then led a British invasion north up the Chesapeake Bay towards the city of Baltimore which culminated in the Battle of Baltimore that September. On September 12, he was shot while commanding troops at North Point, and died while being moved to the rear. Ross was born in Rostrevor, County Down, Ireland, to Major David Ross, an officer in the Seven Years' War and his wife, Elizabeth Adderley, the maternal half-sister of James Caulfeild, 1st Earl of Charlemont. He was educated at Trinity College, Dublin, Ireland, where he was a treasurer of the College Historical Society and joined the 25th Regiment of Foot as an ensign in 1789. Ross was present at the Battle of Alexandria, which expelled Napoleon's army from Egypt. Ross fought as a junior officer at the battles of Krabbendam in the Netherlands in 1799 and the Battle of Alexandria in Egypt in 1801. In 1803, he was promoted to major and given command of the 20th Regiment of Foot. He next fought at the Maida in the Kingdom of Naples in 1806. He was promoted to Lieutenant–Colonel at the end of 1808 and fought in the Battle of Corunna in Spain in early 1809 during the Peninsular War. In 1810, Ross was made a full Colonel as well as aide-de-camp to the King. 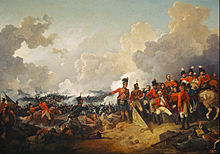 In 1813, Ross was sent to serve under Arthur Wellesley and commanded his regiment at the battles of Vittoria, Roncesvalles, and Sorauren that year. He was seriously wounded in the left side of his neck at the Battle of Orthez, on 27 February 1814, and had just returned to service when he was given command of an expeditionary force to attack the United States. Ross sailed to North America as a Major General to take charge of all British troops off the east coast of the United States. He personally led the British troops ashore in Benedict, Maryland, and marched through Upper Marlboro, Maryland, to the attack on the Americans at the Battle of Bladensburg on 24 August 1814, causing the hastily organised militia of the American army to collapse into a rout. Moving on from Bladensburg, Ross moved on to nearby Washington, D.C., and was fired upon; his horse was shot from under him. The public buildings, facilities and Navy Yards of the city, including the United States Capitol and the White House were burned as retaliation for destructive American raids into Canada, most notably the Americans' Burning of York (modern Toronto) earlier in 1813, which were themselves in retaliation to British raids into the United States. Controversy surrounds Ross's decision to destroy public property but spare a lot of private property during the burning. In reality several private properties were completely destroyed or damaged. Ross then was persuaded to attack Baltimore, Maryland. His troops landed at the southern tip of the "Patapsco Neck" peninsula (between the Patapsco River and Baltimore Harbor on the south and Back River on the north) of southeastern Baltimore County at North Point, twelve miles southeast from the city, on the morning of 12 September 1814. En route to what would be the Battle of North Point, a part of the larger Battle of Baltimore, the British advance encountered American skirmishers. General Ross rode forward to personally direct his troops. An American sharpshooter shot him through the right arm into the chest. According to Baltimore tradition, two American riflemen, Daniel Wells, 18, and Henry McComas, 19, fired at him and one of them had fired the fatal shot. Ross died while he was being transported back to the fleet. Ross's body was preserved in a barrel of 129 gallons (586 l) of Jamaican rum aboard HMS Tonnant. When the Tonnant was diverted to New Orleans for the forthcoming battle in January 1815, his body was shipped on the British ship HMS Royal Oak to Halifax, Nova Scotia, where his body was interred on 29 September 1814 in the Old Burying Ground. By the beginning of the Troubles in the 1960s, the monument in Rostrevor - now located in a predominantly Roman Catholic region - was largely neglected and overgrown by brambles; this may have contributed to its avoiding the same fate as Nelson's Pillar in Dublin, which was reportedly blown up by the IRA in 1966. After the Good Friday Agreement in 1998, the Newry and Mourne District Council, though largely Irish republican, agreed to refurbish the monument as part of Rostrevor's history, and it was reopened in 2008. Neither General Ross nor his immediate descendants were knighted or received a title of nobility. However, his descendants were given an augmentation of honour to the Ross armorial bearings (namely, a second crest in which an arm is seen grasping the 15 stars and 15 stripes on a broken staff) and the family name was changed to the victory title "Ross-of-Bladensburg", which was granted to his widow. In honour of the history of Washington, D.C., there is also a portrait of Ross in the U. S. Capitol's rotunda and several illustrations in various War of 1812 historical sites in the Baltimore area, including a Monument near the site off Old North Point Road where he supposedly was shot. Additional details and exhibits have been preserved in various Baltimore historical institutions, such as the Star Spangled Banner Flag House (also known recently as the Flag House and Star-Spangled Banner Museum) and the National Park Service site of Fort McHenry's visitor center exhibits and in the local Dundalk-Patapsco Neck Historical Society museum in Dundalk. Traditionally the two snipers/riflemen "Wells and McComas" (of the unit of Aisquith's Sharpshooters") were buried in a local churchyard mourned by their fellow soldiers and citizens of the Town, but later in the 1850s were exhumed and reburied after elaborate processions and funerals in a monumental tomb in Ashland Square, off of Orleans Street and North Gay Street in the Jonestown/Old Town neighborhood of East Baltimore. City streets were also named for them in South Baltimore. ^ Mitchell, W (1897). Major-General Robert Ross in Journal of the Royal United Service Institution (Volume 41, Issue 1 ed.). London, England: J. J. keliher & Co. p. 117. Retrieved 19 August 2018. ^ Markham, Edwin (1912). The Real America in Romance Valor and Victory: The age of Vindication 1783–1824 Volume X. New York City, Chicago: William H Wise & Company. pp. 370–382. ^ "Fort Warburton". U.S. National Park Service. 19 July 2007. Retrieved 15 December 2007. ^ Laura Rich. Maryland History In Prints 1743-1900. p. 43. ^ Vogel, Steve (24 October 2013). "The War of 1812 and the capture of Washington, through British eyes". The Washington Post. Retrieved 8 August 2017. ^ "Robert Ross: The NI man who started the White House fire 200 years ago". BBC News. 24 August 2014. ^ Ross Family History[permanent dead link]. Igp-web.com. Retrieved on 4 June 2011. ^ Fox-Davies, Arthur Charles (1909). "A Complete Guide to Heraldry". pp. 113, 474, 593, 374. Ross is a featured supporting character in Eric Flint's alternate history novels, 1812: The Rivers of War, and 1824: The Arkansas War. "Ross, Robert (1766-1814)" . Dictionary of National Biography. London: Smith, Elder & Co. 1885–1900. Wikimedia Commons has media related to Robert Ross. This page was last edited on 22 April 2019, at 03:24 (UTC).